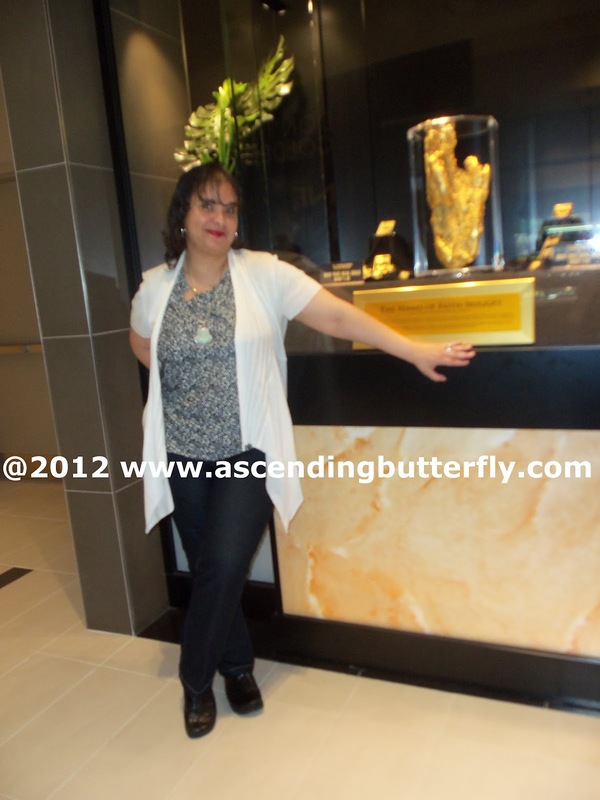 Ascending Butterfly: Wordless Wednesday: Hand of Faith Gold Nugget was on Display! Wordless Wednesday: Hand of Faith Gold Nugget was on Display! Check out that shiny nugget! On loan from Golden Nugget Las Vegas and weighing in at 62 pounds with a value of $5 million, the "Hand of Faith" gold nugget is currently on display in Atlantic City at the Golden Nugget. It was found in 1980 by Kevin Hillier using a metal detector near Kingower, Victoria, Australia. The gold nugget was only 12 inches below the surface in a vertical position! The Hand of Faith is the biggest gold nugget in existence, the second-biggest ever discovered, and the biggest ever found with a metal detector. Kevin Hillier sold his gold nugget find to Golden Nugget for over $1 million. If only being in it's presence brings me the same luck! FTC Disclosure: This is NOT a sponsored post! I was under no obligation to post this picture or any information regarding Golden Nugget Atlantic City.